Residents beware -- there's going to be a lot more traffic on Kalifornsky Beach Road for the next week. It's the result of work being that will close the Sterling Highway to all through-traffic between miles 105 and 107 starting at 8 p.m. tonight (Friday). 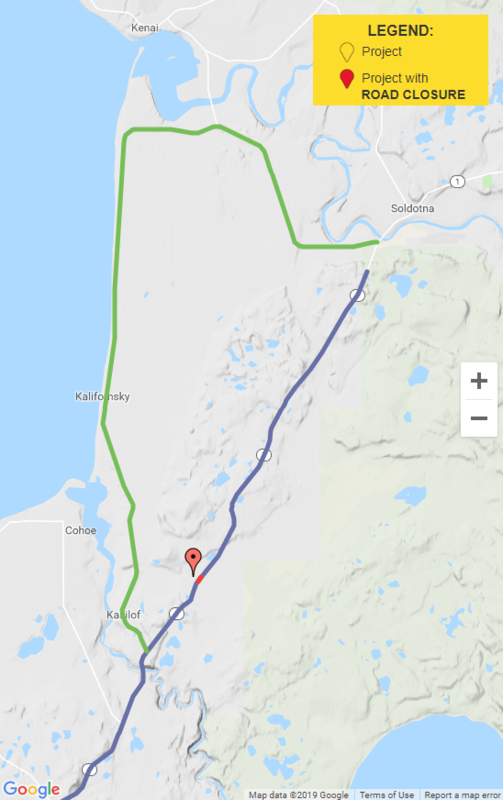 The closure is to replace the Coal Creek Culvert, though southbound traffic will have to detour onto K-Beach Road about 15 miles ahead of that spot in Soldotna. Northbound through-traffic will be diverted at the south end of K-Beach Road. The work will see four new large-diameter culverts place at Coal Creek, Crooked Creek, Clam Gulch and Slikok Tributary (creek), and widened highway shoulders. Crews will be working double shifts on the projects. After last week’s 7.0 temblor, three spots on the Kenai Spur Highway in Nikiski suffered cracks to varying extent at mileposts 19, 35 and 37. But, without any road-building currently active on the Central Peninsula, some repairs will remain gravel for the winter for a lack of asphalt. Shannon McCarthy, a DOT spokeswoman in Anchorage says the repairs here were effected by the DOT’s peninsula maintenance crew.